Homespun Stitchworks..... For the love of vintage: Up & Down Buttonhole Stitch ..... Stitch of the week. 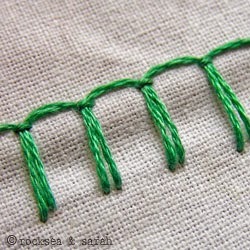 Up & Down Buttonhole Stitch ..... Stitch of the week. We all know button stitch by now but this is a variation and I thought it was worth you all looking at. It is slightly different , more rounded some how with a double line! Anyway take a little look at the tutorial by the talented Mary Corbett and see what you think. I love learning new techniques myself. This is the stitch of the week. Enjoy your weekend and Happy Stitching!